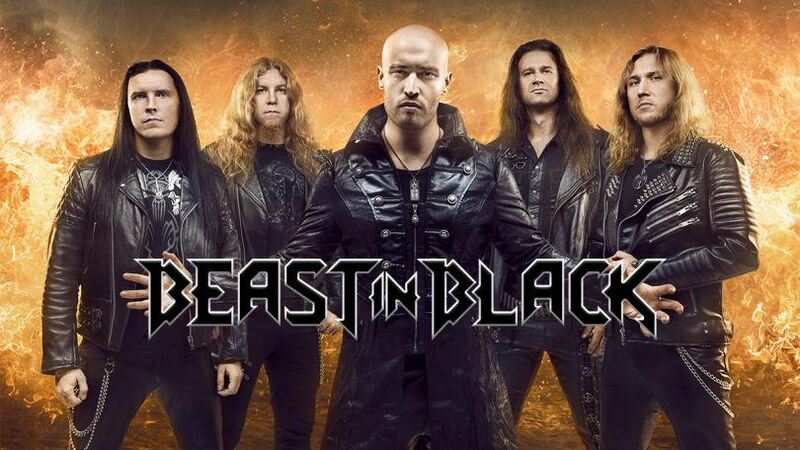 BEAST IN BLACK Interview: "People Sense the Postiive Energy"
With their debut album “Berserker” Finnish power metal newcomers BEAST IN BLACK stirred a lot of interest, securing them a support act slot with musical legends such as Nightwish, WASP, and Rhapsody. The album gave birth to a lot of instant hits that feature a unique blend of power metal bombast, 80’s flare, and frontman Yannis Papadopoulos’ versatile vocals. Now, the band is about to release their sophomore album titled “From Hell With Love” on February 8th via Nuclear Blast Records. 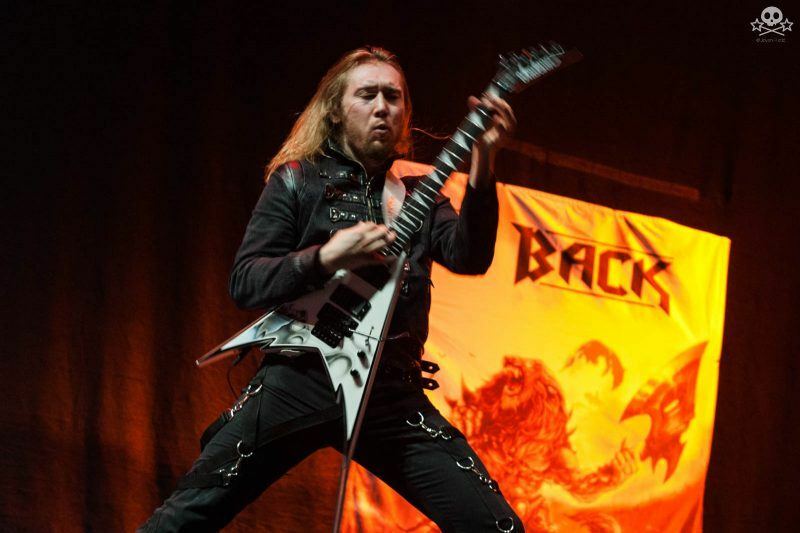 We spoke to Anton Kabanen, creative soul of the band who made his name playing with another highly successful power metal band Battle Beast about what made Beast in Black so successful so fast, what to expect from the new album and more. Your new album “From Hell With Love” is coming out February 8th via Nuclear Blast Records. If you had to describe the album in three words, what would they be? Anton Kabanen: 80’s heavy metal. Between touring with Rhapsody at the start of last year and touring with Nightwish at the end of the year, you were certainly pressed for time. How did all these commitments affect both the songwriting and the production of the upcoming album? Anton:Indeed, we had a tight schedule. But we managed to make the record between the festival gigs. We had almost every weekend between the summer festivals we played. And in the weekdays we just worked on a lot of studio stuff with no social life basically. So that’s the recipe. And it was barely ready on time. It was two or three days before the Nightwish tour started that we got the master file of the album. So it was really tight, but we made it luckily. So here we are now, waiting for the release which is next week. Given all of that, how satisfied are you with the final outcome? Anton: We’re all very proud of it. The first two singles already got a very good response from the fans. The ticket sales for the shows are going well too, so I think people have liked it and are willing to come to see the shows. So there’s nothing to complain about. There’s just so much work going on all the time. Preparations for the release, the headline tour, practicing and lots of things to take care of. But that’s how it goes. It comes with the package. What did the composing process look like? Did you compose on the road? Anton: No, some of the songs were already written before the debut album. Many songs were more or less existing some years ago. Some songs were born very spontaneously like “Oceandeep” or the title track “From Hell With Love”. Those are the newest songs, but all the rest were more or less complete songs or clear ideas from the past. It didn’t really require any specific songwriting for this particular album. It was more of a selection process. There were lots of songs already written. We just listened to the stuff I had written in the past and tried to make a compact album that has enough variety music-wise. It’s hard to pinpoint when the composing started since the songs are from different times. I’ve listened to the album and I really liked it. I’m definitely hearing more 80’s influences on this album, pop and rock alike. Were you inspired by some artists in particular when writing this album, or was it a natural progression for Beast in Black? I believe in the 80’s they made a lot of evergreens. It’s not actually about me believing it, it’s the fact that there are lots of evergreen hits coming from that time. I listened to a lot of that stuff during my life. And I like it, which is why it comes naturally when you absorb the things you like the most it’s there inside you. And when you write it comes from the subconscious, a musical idea you can’t really pinpoint at the moment of writing. But you still write it because you think it sounds cool. And the choice of instrumentation, what kind of keyboard sounds. It’s a matter of taste as well. I just really like the 80’s soundscape and the instrument sounds, mainly the keyboards. And also all of the band members are fans of the 80’s music. We love melodic music very much, so it’s only natural for us to make an album like this. We didn’t deliberately try to do an 80’s album. It just happened that after the selection of the songs the wholeness ended up being strongly 80’s. But I never thought “Hey, let’s make a super 80’s album”. It’s just how it turned out. I was impressed how you managed to capture the feel of the ’80s with the keyboard sounds and particular effects like the synth drum passages, but also have a really modern production. Anton: It’s kind of a hybrid, you could say that. And the synth tones, I love those. It mainly comes from Italo disco. I love it very much. Of course, they use a lot of those. It’s one natural instrument for me. It’s nothing like “let’s make it very special with those drums”. I’ve used those for many, many years and many compositions. So to me, it’s nothing out of the ordinary. It’s funny because in so many interviews I’ve done people point out those synth drums. I think people like those. Even if they don’t admit it, it must be a kind of a guilty pleasure to listen to. I think that there’s nothing really guilty about the 80’s pop. Given the pop today, if things were a little more 80’s today we’d have a healthier music scene overall. Anton: Yes, I agree. Definitely. A lot of the tracks on the album take inspiration from the Berserk manga. Apart from manga and anime, what are some other things you enjoy watching and reading that influence Beast In Black and the lyrics you write? Anton: It’s roughly put in two or three categories. There’s the anime like Berserk or Fist of the Northstar. It’s not a new anime, but it’s new for Beast In Black. We haven’t released a song based on that before. And the opening track, “Cry Out For A Hero” is based on that anime. The rest of the songs are personal thoughts, feelings and statements. Maybe some fictional stuff. I can’t remember all of the songs at the moment or what they deal with, I don’t have the tracklist in front of me. So personal stuff and anime stuff is the main thing on this album, main two categories. If you were to write a concept album, what topic would you choose? Would it be Berserk, another saga or something completely original? Anton: I think Berserk would be nice to make a chronological order. Up till now, it has been songs here and there about Berserk, but not really a chronological order or continuity. Those songs are based on the stuff I like in Berserk. But a full album that goes from Chapter 1, starts there and deals with the first couple of books would be nice. I actually have this personal story written apart from Berserk many years ago, almost 10 years ago or more. But I’m not sure if it’s ever going to see the light of day and how obviously I’m going to write it out. There have been some songs based off of it with my previous band, but I haven’t explained it so openly. It still needs a lot of work to make it into a full, plausible and understandable story. But so far I don’t feel the need to make a concept album out of some personal, fictional stories. There’s already so much great material in the world to work on, so I’m very happy with that at the moment. 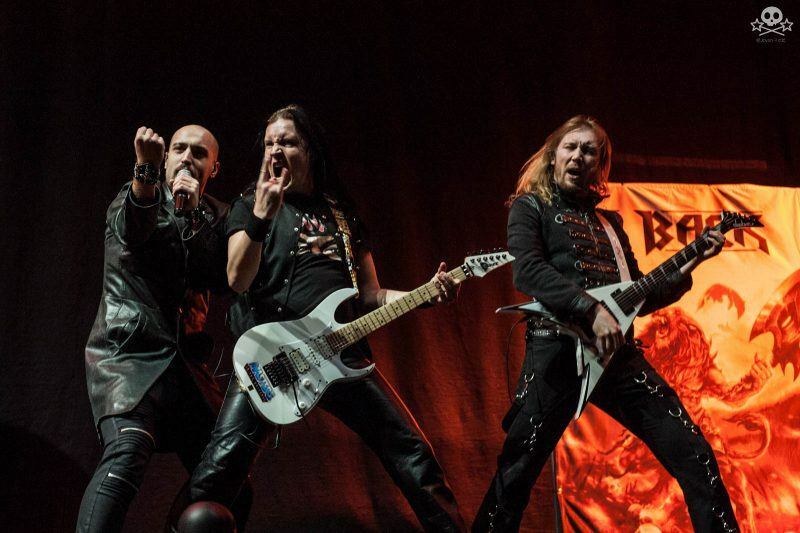 Last year you toured with two legends in their own right who in their own way helped shape the power metal scene. What, if any, lesions did you learn from working with them that you’ll take with you in the future. Anton: It’s hard to name any specific things. The main thing I’ve learned overall from touring last year is to have a great balance, great chemistry in the band between the members. That is the most important thing when it comes to touring. If you have problems, even with one person then it affects the whole group’s atmosphere. So that is the most important thing I realized. We had a great atmosphere there and I thought about it afterward when the tours were over. I thought “Hey, we just had a year full of gigs and we really enjoyed each other’s company.” It was great, and we’re hungry for more. That’s the biggest thing. What I also learned from Nightwish and Rhapsody is that they are so down to earth, both bands. So stay that way, stay yourself, don’t start acting cocky or like a rock star. Be a normal human being. That’s how we felt when we were with them. It’s a great attitude, a great way how they are professionally and personally. As a band with only the debut under your belt, you’ve definitely gained a lot of fans over a very short period of time. What do you attribute your success to? Anton: Many things. It’s a combination of everything because we try to do everything as perfectly as possible. It starts with the songs because songs are what we deliver to people. That’s the main thing. After that, you start building up everything else. You make the promo pictures, music videos, play gigs, think of the show elements like how to move on the stage with certain guitar riffs. But everything comes after the songs are there. To be able to do all that stuff after the songs are there, you also have to have a great team. And not just the band members – a great booking agent, and we have great booking agents in Europe and Finland. Also management, record label; all these pieces of the puzzle fit in the right spot. And of course, I know that there is some help from the past due to my connection with Battle Beast. Many people were waiting to see what’s the next thing that I’m going to do. So fans from those times, of course, were aware of this. So all these things helped. But in the end, I would still say it’s what we do together, it’s never just one thing that can make you successful. It’s everything put together. And I think we’re doing something good because if we were doing it bad we wouldn’t be in this situation at the moment. I have to be honest, your debut flew under my radar when it came out. It was only after I saw you supporting Rhapsody that I became completely obsessed. I was also blown away by your show with Nightwish, both in Budapest. Therefore, I’d say one of your biggest strengths is your live performance. How did you prepare for these tours? Anton: Usually we have one week of rehearsals before a tour or a special event, and that’s about it. We just plan the choreography and some of the speeches. Just try to go through the show, song by song and what to do in each song. Apart from that, it has to happen naturally and you have to enjoy it. And we do. At some point, we realized that we kept getting a lot of feedback from people who kept saying “guys, you are always smiling on stage, every one of you.” And we didn’t think about it, but it’s true. It is a part of our show element. We want to do it with a lot of positive energy and power. Not like serious, angry metal warriors. Not that type of stuff, even if some songs have some nasty contexts and themes that they deal with. We still play them with positive energy. I think it’s one of our strongest points, keeping it positive. People sense it, they see it in our eyes and smiles. And we see it on their faces, in the audience. It goes both ways. I think that’s what you really need when you come to see a show. You want to forget about your worries and whatever is going on. It has to be pure entertainment and escapism for the short time you are there. Given the fact that you are a multinational band with members from different countries, how hard is it for you to organize for rehearsals, both live and studio practice, composing and everything. Anton: It takes time of course. We always have to prepare in advance for everything we want to do together as a group. We always try to look a couple of months, a few months or a year ahead of time to plan the recordings and stuff. It just takes careful planning. You have to sit down and check out flights, talk on the phone, lots of talking always going on, writing messages, emails… Being constantly in touch with others. That’s how we make it happen. With the rehearsals, everyone has done their homework well. So we don’t learn the songs there, we just try to make them tied. Everyone does their personal practicing properly before the band rehearsals. You have a tour in support of the album upcoming, your first headlining tour. A few dates in Europe – do you maybe plan on expanding the tour later in the year, after the festivals, to some other parts that haven’t been announced yet. Anton: Yes, we want to do that and maybe we will because we actually have some alternatives what to do in autumn, what kind of tour plans. We are working on that at the moment, our booking agent is working on it with our management. Whenever there’s new shows or new tours coming up we’ll definitely inform people. It will surely happen, but at the moment we cannot say anything 100% confirmed. But there will be some shows in the autumn for sure. That’s great! I have a couple of questions from fans I’ve gotten through Instagram if you are willing to answer them? From Nataša, who says hi: Given that your music heavily relies on the keyboards, especially on the new album if I might add, have you considered adding a permanent keyboard player to your lineup? Anton: Hello Nataša and no, we haven’t. There’s so much stuff coming from the backing tracks that one keyboard player wouldn’t be able to play more than maybe 30% of the needed keyboard stuff. So we would still have to heavily rely on backing tracks. And in addition to that, we would need to have a keyboard player on stage. That’s more technical stuff, more logistics and more expenses. Whenever there’s one person more, there are more problems. It might sound negative, but whenever you’re organizing stuff it’s always like that. A question from Mateja who asks: Did you expect the wild success that followed “Blind and Frozen” which is definitely one of your trademark songs? Anton: We had no expectations whatsoever when the video came out or the album. We were totally blown away by that response of the people and how the song found its way to people’s hearts. It’s a great thing for us, it boosted us strongly. No one could anticipate anything like that. We just did the best we could with the first album, and thought “this is what it is and let’s see what happens”. Now the thing is to keep going that same way, up and forward and not to stop. And that’s the biggest challenge, to continue down that same road you started and not go down. He has a follow-up question: how do you feel about a lot of people comparing the track to Nightwish and a lot of people comparing Yannis’ vocals to Tarja? Anton: I would say people have a tendency to categorize things. I don’t mind it at all. It’s natural, people do that. As long as they enjoy the song, that’s the most important thing. They can hear whatever influence is there. For example, with the second album and the first music video “Sweet True Lies” many people hear Backstreet Boys influences. And I’m like “err, what.” I never listened to that stuff. But many people hear that there. I don’t take it as a bad thing. It’s just funny. Sometimes there are very surprising references that people write or tell about. But in “Blind and Frozen” it’s a different thing. It really was, excuse my language, a mindfuck when they heard Yannis singing the verses because they really thought it’s a woman. But it turned out to be a guy with a beard (laughs). We did it in the studio because I remembered Yannis recorded a Nightwish cover of “Sahara”. And there was this part where he sings so delicately, but I didn’t know it was him. So I asked him “who is this woman featured on the chorus”. And he said “what woman” because he was singing everything. So that gave me an idea to use that type of voice in some of the Beast in Black songs. We tried it for “Blind and Frozen” and “Ghost in the Rain”. And it fits there perfectly. We didn’t do it to fool people. It’s because it fits in the atmosphere and the lyrics, what he sings about. And musically speaking, it justifies its place there in the context of the song, that type of singing. But that was also surprising, how strongly that was noticed by the public. “Hey, it’s a female singer. No, it’s a guy. Wow”. We didn’t think it was going to be like that. Usually, in heavy metal or power metal bands the vocalists are not noted because of that type of singing, but because of their voice and how high they can scream or how strong. But we had the exact opposite. We had a great singer, but he sang as softly as he possibly could. So we did the exact opposite. Sometimes that can cause a bigger reaction instead of singing with full force or screaming super-high. It’s definitely a refreshment, and the most impressive thing is that he can pull it off live, night after night and it sounds as good as it does on CD. Anton: Yeah, Yannis is a freak of nature. I don’t understand how he can maintain his vocals and his voice in that great shape, night after night like you said. Keep him away from cold beer and cigarettes and you’ll be fine for years. I won’t take any more of your time. I wish you the best of luck with the album and tour and hope to see you again real soon. Do you have any last words for our readers and your fans in Serbia? Anton: First of all, thanks for checking out this interview. Stay tuned for Beast in Black news. Get the new album when it’s out on February 8th. Hope to see you on the road!